Who doesn’t love a good roast beef dinner? 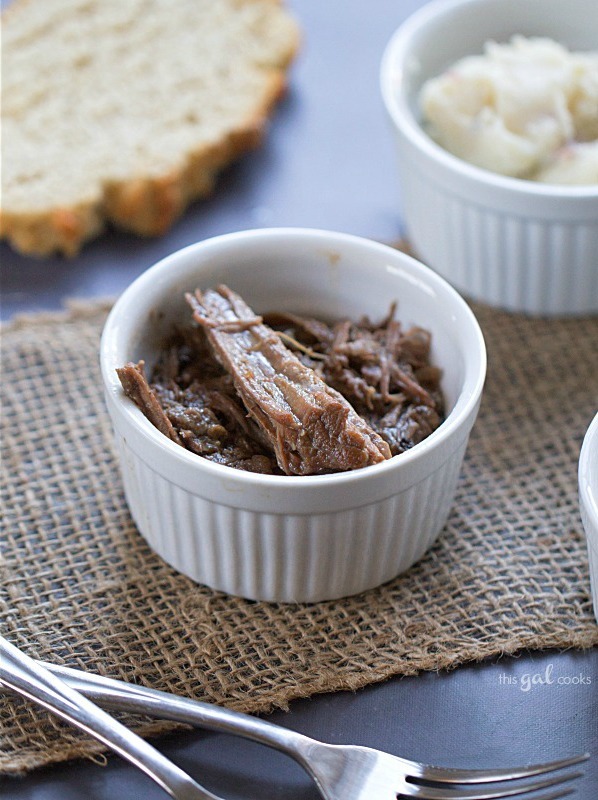 This Super Simple Crockpot Roast Beef is slow cooked in an onion soup and beer mixture until it’s so tender that it falls apart with the touch of a fork! I like beer. And I like roast beef. Did you know that you can use beer in cooking much like you use wine? Well, you can. You learned something new today, eh? The rules are basically the same as the rules for wine: when cooking with beer, be sure to use a good quality beer that you would actually drink. Experiment with different flavors. Make the same dish twice with two different beers and you’ll notice subtle differences in the flavor of the food. When I use beer in beef recipes, I like to use a good hearty dark beer. For this recipe, I used Guinness. If you’ve been following this blog for a while, then you know I have a great love of a good beer. If you haven’t been following that long, well hello there! I’m Julie and I love a good beer! My good bloggy friend Carrie from Frugal Foodie Mama loves beer too. We love cooking with beer and booze so much so that we started the Spiked! Recipe Challenge to get other home cooks motivated to cook with booze too! We will actually have another challenge starting tomorrow so stay tuned and join us if you love to cook! 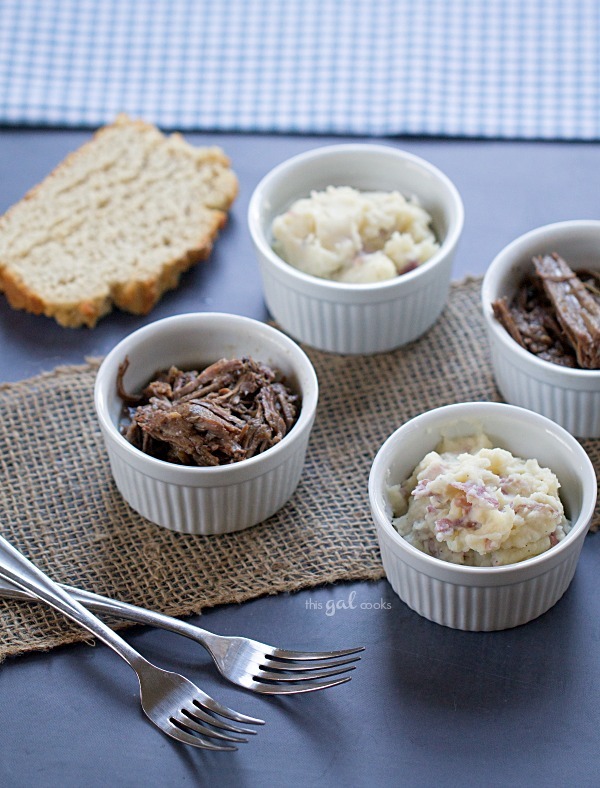 This Super Simple Crockpot Roast Beef is well, super simple to make. I made a flour/spice mixture and coated the chuck roast in it and then browned the chuck roast in some butter. While that was happening, I mixed a packet of onion soup mix with a can of Guinness and poured it into my crockpot. I placed the browned chuck roast into the crockpot and then poured the juices from the pan over top, covered the crockpot and cooked on low for 8 hours. Serve it with mashed potatoes and roasted brussels sprouts with bacon and you have yourself on hearty meal! Enjoy the recipe! In a mixing bowl, whisk together the flour, ground thyme, seasoned salt, ground pepper and kosher salt. Coat all sides of the chuck roast with the mixture. In a large skillet over medium high heat, melt the butter. Add the chuck roast and brown on all sides, even the small sides and edges. Meanwhile, whisk the onion soup mix and the Guinness beer together. Pour into the crockpot. Once the chuck roast is done browning, place it in the crockpot. Scrape the skillet and pour the juices and bits into the crockpot, making sure to pour some on top of the roast as well as into the onion soup/beer mixture. 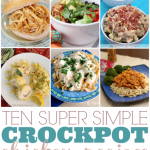 What is your favorite recipe to make in the crockpot? What types of time saving recipes do you like to make? Next Post » Thanksgiving Cooking Tools Giveaway! 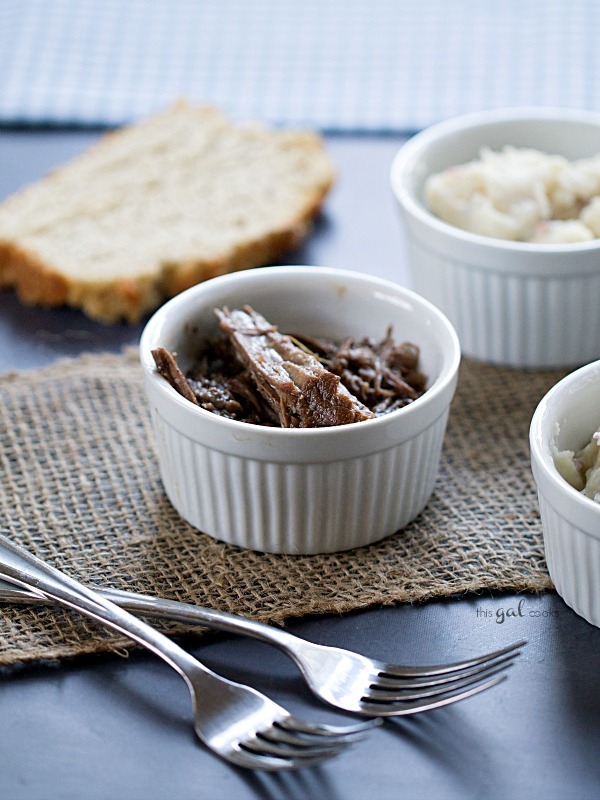 I have been looking for a good crockpot roast beef recipe. This one looks so quick and easy, and the meat is so moist. 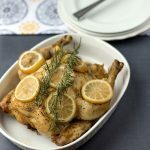 I am going to add it to my weeknight menu for next week. Happy Halloween, Julie! I constantly have something going in my slow cooker! I need to try this! Love this, Julie! :) This looks so good! I am excited for Spiked! tomorrow! I NEED to get a crockpot. This roast beef look so good. What a perfect fall dinner! 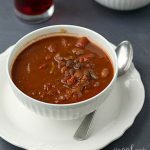 It is absolutely annoying that I don’t have a slow cooker when I see some great dishes like this. I can’t wait to get mine this weekend. A great looking and easy dish. Love crock pot beef, but totally love that you added beer to this mixture. Bet the taste is incredible! Pining, thanks for sharing Julie! You’re welcome, Krista! Thanks for the pin! You are so good about incorporating beer into recipes, we need to hang out! I love it! This is perfect comfort food Julie. I’m glad you shared this with Saturday Night fever Link Party! Yeah! We’d have a good ole time if we hung out! Lots of beer and good food. YUM! Have this cooking right now! Thanks for the easy recipe! You’re welcome, Adam! I bet your house smells good right now! My house always smells amazing when I make this in the crockpot. Enjoy! Wow! The roast was super awesome, moist, flavorful, and just falls apart. I used a bottle of Heineken and 4oz of SoyVay Veri Veri Teriyaki. Thank you so much for the reciepe! Let me tell you what I did and what I am planning to do. That is if you give me the approval. For the past fifty or so years I had nothing to do with cooking. What ever my wife cooked I said it was the greatest meal ever. I find myself in the position of having to cook a little. Tonight I cooked a piece beef. What cut? Well until I read your column I did not know there were so many. I put the meat in a Pyrex Dish with a package of seasoning that said it was for making something is a slow cooker. I covered it with foil, set the oven for 350 and let it cook for 3 hours. After 2 hours I put in a potato. Good thing I did or I would not have had anything for supper. Why not? Well the meat was,tough. Did I say tough? Actually, I wish my boots had soles as hard as this piece of meat. I would never have to have them half soled again. I am sure you get the picture. So what am I planning to do to save this piece of rawhide. While looking through the kitchen cabinets I found that my wife did in fact have a slow cooker. I was thinking that I would charge it with the meat, two medium size potatoes cut in chunks, a half dozen small onions, and any other fresh vegetables I find. Cover it with water. Set the temperature on low and let it cook for 6-8 hours. So what do you think? Usually food only has to be bio-degradable for me to consume it. And, of coarse, it has to be soft enough that I do not fracture my dentures. This is in the crockpot now and I can’t wait to try it! One question…since the roast is not completely submerged in the beer, do you flip it every so often? Thanks!